Mt Arthur Community Centre is a Tamar Region NRM Demonstration Site which has many activities being undertaken by the local community. Significant threatened fauna species habitat the waterways and wetlands of the Mt Arthur area and the community group is actively controlling invasive blackberries and restoring the riparian zones with native flora. Regular working bees to remove weeds and replant native flora occur throughout the year. Field days also provide guided walks looking at fauna habitat, flora studies and discuss the values of environmental conservation. The Mt Arthur Community Group support is provided by: Launceston Horticulture TAFE, Launceston Environment Centre, The Understorey Network, Tamar Region NRM and Tamar Valley Weed Strategy. 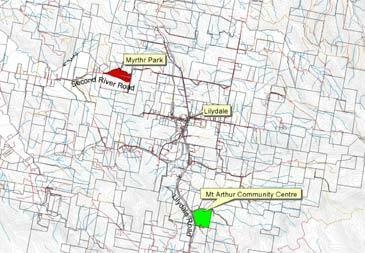 The Mt Arthur Community Centre is situated on White Mills Road just before Lilydale, and only 30min drive from Launceston (pictured in bright green on map). Contact the Mt Arthur Community Centre office on 6395 1201 (during business hours) for upcoming activities or check the TVWS website for “News and Events” calendar.